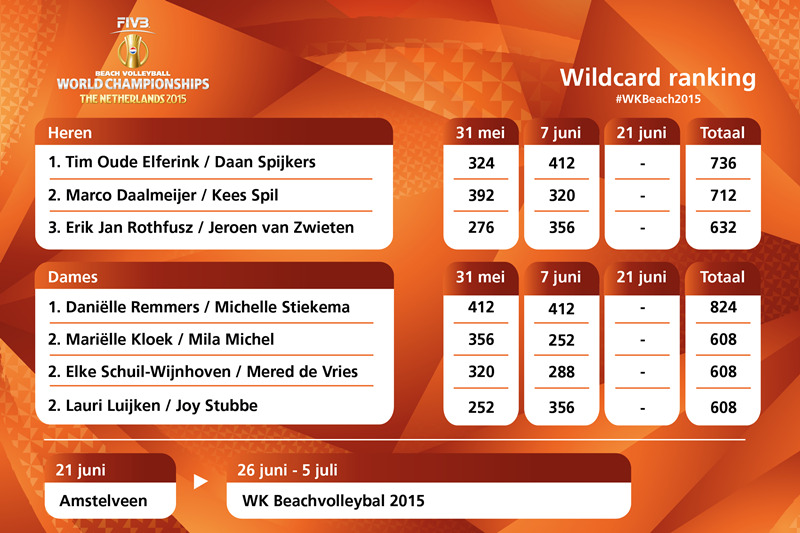 Vlissingen, Netherlands, June 19, 2015 - The final two berths for the FIVB Beach Volleyball World Championships The Netherlands 2015 will be filled next Sunday by two Dutch teams, following the third and final wild card event for both men and women which will be played on Saturday and Sunday in Amstelveen. The Dutch men's qualifying event proposes a close battle for participation in the World Championships. Three teams are still in the running for qualification. These teams collected medals in the first two of three qualifying events. Marco Daalmeijer and Kees Spil won the event in Arnhem and took third place in Vlissingen. Daan Spijkers and Tim Oude-Elferink claimed a silver and a gold medal and are leading the wild card ranking. Eric-Jan Rothfusz and Jeroen van Zwieten are currently third. For Spijkers, that would be his third participation in the World Championships, following Rome (2011) and Mazury (2013). In the women’s event this weekend, less drama is expected. Daniëlle Remmers and Michelle Stiekema won the first two qualifying events and have a comfortable lead in the ranking. Mariëlle Kloek/Mila Michel, Elke Schuil-Wijnhoven/Mered de Vries and Lauri Luijken/Joy Stubbe trail the top team by a considerable distance.